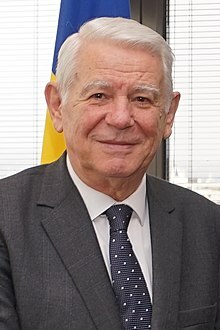 Teodor Viorel Meleșcanu (Romanian pronunciation: [teˈodor meleʃˈkanu]; born 10 March 1941) is a Romanian politician, diplomat and jurist. He served as Director of the Foreign Intelligence Service of Romania (SIE) between 2012 and 2014. He was a three times senator for the National Liberal Party (PNL), Minister of Defense between 2007 and 2008, and Minister of Foreign Affairs between 1992 and 1996, in November 2014 and since January 2017. He was married to Felicia Meleșcanu, a jurist and Romanian Television journalist, until her death in January 2004. On February 27, 2012, upon his appointment as head of the SIE, he suspended himself from PNL and was later expelled from the party. Born in Brad, Hunedoara County, he was baptized in the town's Romanian Orthodox church. Around the age of five, he left for Buteni, his grandparents' village, located near the Crișul Alb River. Meleșcanu then studied at Moise Nicoară National College in Arad. He graduated from the Faculty of Law of the University of Bucharest in 1964 and the Faculty of Economic and Social Sciences of the University of Geneva in 1968. In 1973, he obtained a doctorate in political science and international law from the University of Geneva and the Graduate Institute of International Studies. Between 1966 and 1990 he held various diplomatic functions in the Ministry of Foreign Affairs. In August 1990 he was named undersecretary of state in this ministry. Between November 1992 and November 1996 he was the Minister of Foreign Affairs in Nicolae Văcăroiu's Party of Social Democracy (PDSR) government. In 1996 he campaigned as an independent for election to the Senate from the Prahova County electoral district. He was elected to that body, becoming president of the Foreign Affairs Committee of the Senate of Romania in the 1996–2000 legislature. In 1997, Meleșcanu founded the Alliance for Romania (Alianța pentru România) party, together with several former members of the PDSR (Mircea Coșea, Iosif Boda, and others). He was elected president of this party in December 1997 and re-elected in March 2001. In January 2002, in the wake of the Alliance for Romania's merger with the PNL, Meleșcanu became first vice-president of the latter party. Since 2004, he has been a Liberal senator for Prahova, also being a vice-president in the Permanent Bureau of the Senate. He is a professor at the Faculty of Political Sciences of the University of Bucharest, and has written a substantial number of works and scientific publications dealing with international law and diplomacy. On February 27, President Traian Băsescu appointed him for the SIE position vacant after the former director Mihai Răzvan Ungureanu's ascension to the post of Prime Minister. In 2013 he was awarded Commander's Cross with Star of the Order of Merit of the Republic of Poland. In November 2014, following the resignation of Titus Corlățean as a result of problems with voting in the Romanian diaspora during the first round of that year's presidential election, Meleșcanu was appointed foreign minister. He resigned eight days later, after similar problems took place during the second round. After his resignation, he joined the advisory board of the Fourth Ponta Cabinet regarding security and defense affairs. After Ponta was replaced by Dacian Cioloș, he was dismissed and joined ALDE. In January 2018 he became again Foreign Minister of Romania, this time in Dăncilă Cabinet. Meleșcanu is a Member of the Advisory Board of the Global Panel Foundation, based in Berlin, Copenhagen, Prague, Sydney and Toronto, which works behind-the-scenes in conflict areas around the world. ^ "Teodor Meleşcanu demisionează din funcţia de ministru al Afacerilor Externe, la opt zile după ce a preluat portofoliul" (in Romanian). Mediafax. 24 November 2014. ^ "Teodor Melescanu joins ALDE". Romania Journal. 6 January 2016. This page was last edited on 19 January 2019, at 21:31 (UTC).